"We've got a good team of seven partners, we're all best friends, and we've built a great network and a great company," says the 38-year-old. "We look at opportunities first to see if they will work for our culture and company. Money is the last piece. It always figures itself out." Bhakta describes the company's culture as a family-oriented, fun environment where they work hard and play hard. Outside of work they have regular family outings and often vacation together. "We think about everything and do it for the greater good of the company. We've been together for a long time," he says. As the most experienced member of the group, Bhakta's focus is on strategic partnerships and growing the company's diverse portfolio. As both a franchisor and a franchisee, he's found great success in diversifying the group's portfolio by pursuing different brands at different times. Managing multiple brands across 27 states is no small task, but he says his shared services approach provides a brand-agnostic infrastructure able to support different brands and their different needs. The partners first became franchisees in 2001with the fledgling Genghis Grill brand. It took them 18 months of hard work and sweat equity to reach breakeven. Three years later they bought out the concept. Today the group operates 147 KFC/Taco Bells and 5 La Madeleine franchised units. It also is the franchisor of 79 Genghis Grills, 12 Elephant Bars, 5 Fireside Pies, 4 Ruby Tequila's Mexican Kitchens, and 1 Pepper Smash. "Diversification hedges us against economic downturns when people are trading up or down, and it helps us with certain regions," he says. Bhakta cited changes in technology and innovation as the biggest challenges facing the restaurant industry. New ways to deliver the end product to customers, the growth of delivery companies, and online ordering are compelling technologies companies must figure out and embrace to remain competitive. "The industry is shifting that way fast," he says. "We're not on the forefront of any single innovation. We observe them all and see what works, see what's not working, and take what's the best in class. We want good ideas that rise above the rest." Part of making it in the current franchise climate, he says, is understanding the Millennial customer. "They've basically grown up with technology in their hands at all times. They are an informed consumer with information at their fingertips. We have to deliver what they want." Millennials, he says, are looking for constant stimulation, which could have a big impact on how often a restaurant changes its menu or remodels. 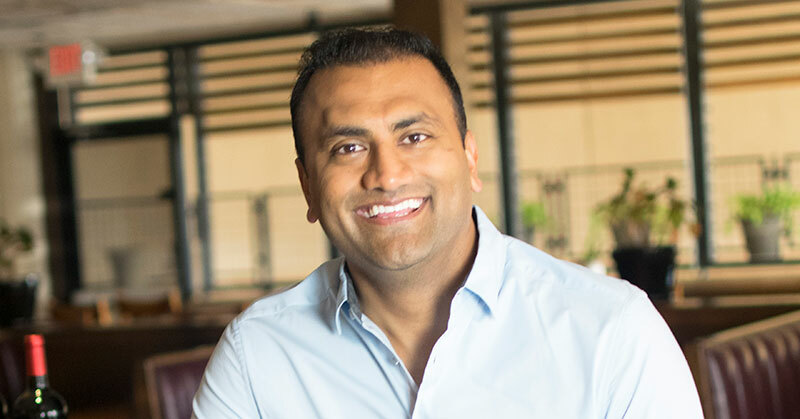 Internally, when it comes to providing growth opportunities for people in the group, Bhakta is always looking to "fill his boat," by which he means constantly adding qualified talent to rise within the company as it grows. With more than 8,500 employees and a track record of solid growth, that's a big boat to keep full. Looking ahead to 2017, Bhakta says the company's goals are to grow the La Madeleine franchise with new development, to grow KFC with new development and acquisitions, and to expand the Fireside Pies brand with new development. As he tries to move closer to operations and better understand the changing customer base, Bhakta plans to travel the country and get to the group's restaurants more often. "We've got a great team of operators right down to the general managers who are running things well. I don't need to be there, but I learn every time I'm in the stores," he says. He estimates that he visits more than 40 restaurants a year. His advice to future generations of restaurant franchisees is to roll up their sleeves and get their hands dirty. "Be prepared to work hard in the restaurant space. It can't be part-time. It has to be 120 percent. If not, it will lead to failure." No. of units: As a franchisee, 147 KFC/Taco Bell, 5 La Madeleine; as a franchisor, 79 Genghis Grill, 12 Elephant Bar, 5 Fireside Pies, 4 Ruby Tequila's Mexican Grill, 1 Pepper Smash. Stock boy at a grocery store. 2011 Top Executive to Watch Nation's Restaurant News; 2012 Entrepreneur of the Year Nominee Ernst & Young; 40 Under 40 Honoree, Dallas Business Journal. Navigating through competitive intrusions in the restaurant industry. Deciding to raise outside capital for an acquisition. Partnering with my best friends. Hire people who can do what you can't. High-intensity interval training and yoga. Seeing people evolve in their careers and roles. Not as close as I should be. To have a partnership mindset. Coach them and/or let them go. To grow the La Madeleine franchise with new development, grow KFC with new development and acquisitions, and to expand the Fireside Pies franchise with new development. Growth meter: How do you measure growth? Same store sales, year-over-year traffic, and increased revenue. Yes, certain markets like the Mid-Atlantic, Midwest, and Texas outside the oil markets. We need to be constantly nimble. Annual planning with quarterly adjustments. Banks, family offices, and private equity. Yes, overall good experiences. There's lots of capital in the market. Trying to stay ahead of the curve with 401(k) plans, technology, creative bonus programs, etc.